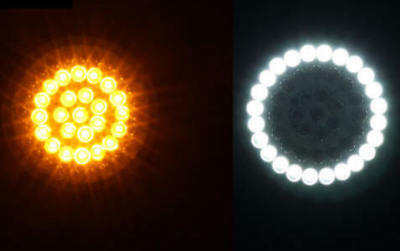 12 center amber LEDs function as the turn signal. When a turn signal is activated the White LEDs turn completely off for the entire turn signal cycle providing greater visibility to the amber turn signal. 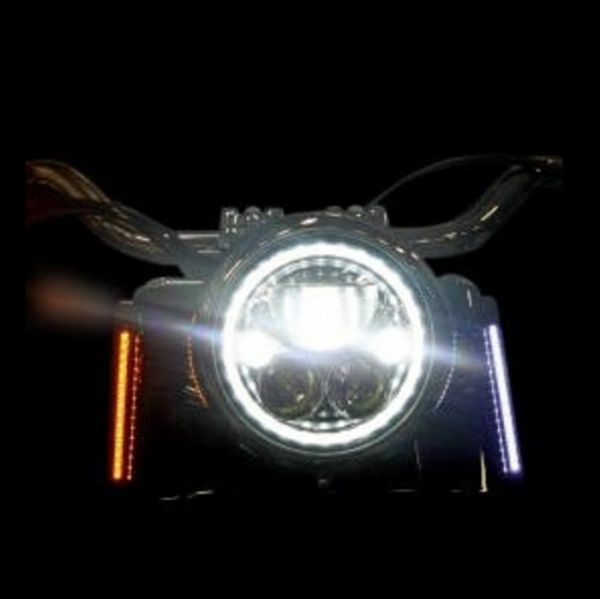 ProBEAM® Turn Signals include smoked lenses, are DOT and SAE Compliant, made in the USA, and backed by the Lifetime LED Warranty. Sold as a Pair. used with ProBEAM® Smoke Lenses. and OEM Bullet Style lens. 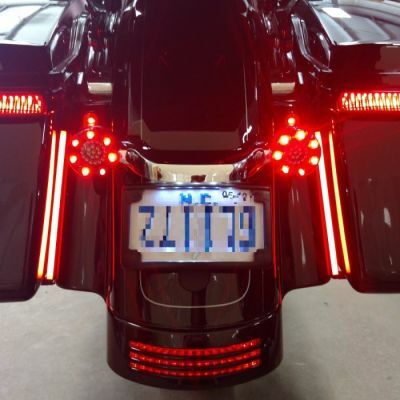 Touring and Trikes and all V-Rod® models to ensure proper turn signal function and flash speed. 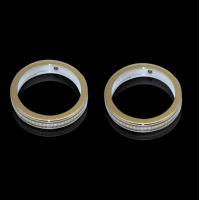 ProBEAM® Amber/White Dynamic Ringz™ also available for International (HDI) Models. the Lifetime LED Warranty. Sold as a Pair. Plug & Play on US Model 1986-2013 Electra Glide® Models, 1986-2018 Road King® models, 1986-2017 Heritage Softail®, 1999-2003 Road Glide® & 2005 Road Glide® Classic Harley-Davidson®s with Flat Style (2 screw) turn signal lenses and 1157 front dual contact bases (Does NOT Fit CVO™ Models). 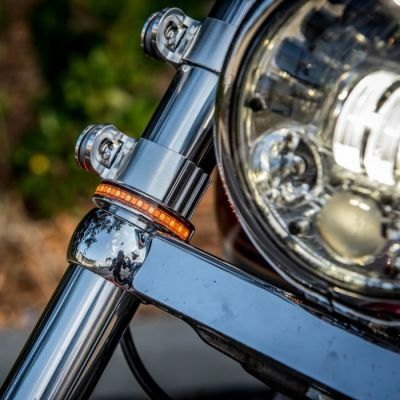 ProBEAM® Amber/White Dynamic Ringz™ also available as Bullet Style for fitment on models with Harley-Davidson® OEM bullet style turn signals and for CVO™ models. 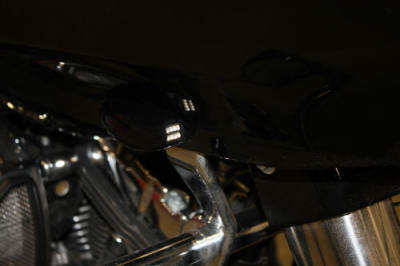 A variety of ProBEAM® Turn Signal Accessories also available to add a custom look to your bike. 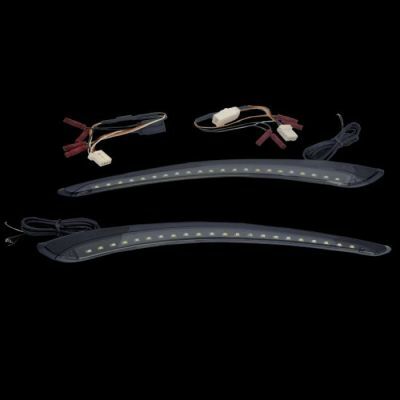 Utilizing advanced LED technology, the ProBEAM® LED turn signals maximize performance with a unique reflector technology and automotive grade LEDs composed into a sealedunit for superior reliability. 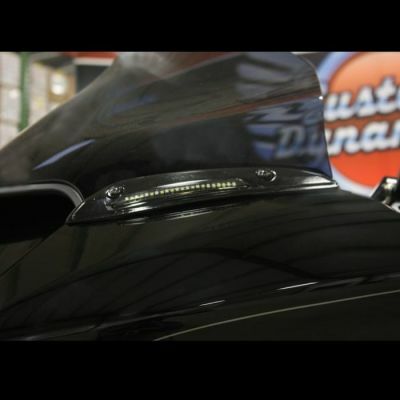 Building upon our famous Dynamic Ringz™, ProBEAM® turn signals utilize automotive grade LEDs to produce an even brighter light output withwider viewing angle. 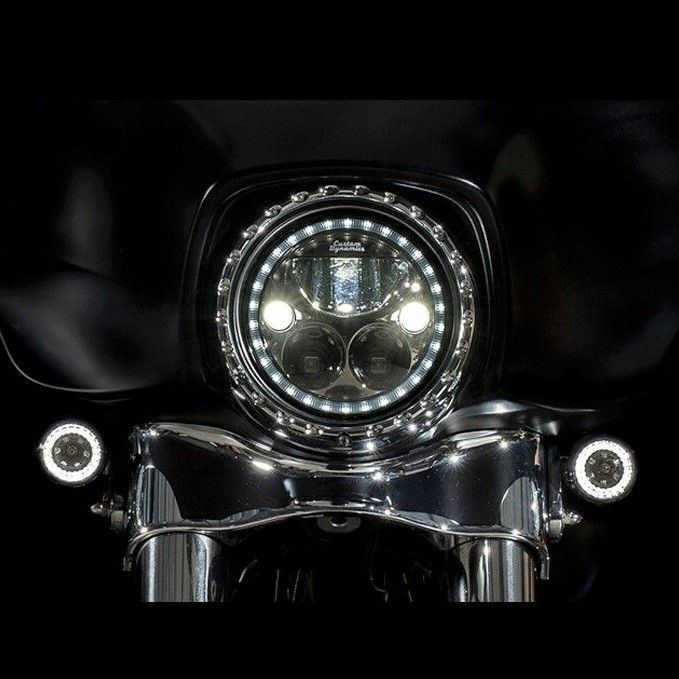 The outer ring of 24 white ProBEAM® LEDs showcase a smooth white halo that functions as the running light while 12 center amber LEDs function as theturn signal. When a turn signal is activated the White LEDs turn completely off for the entire turn signal cycle providing greater visibility to the amber turn signal. 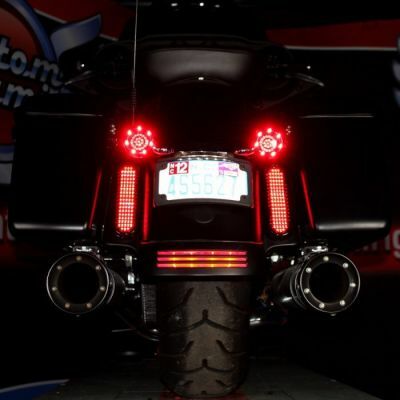 ProBEAM® Turn Signals include red lenses, are DOT and SAE Compliant, made in the USA, and backed by the Custom Dynamics® Lifetime LED Warranty. Sold as a Pair. 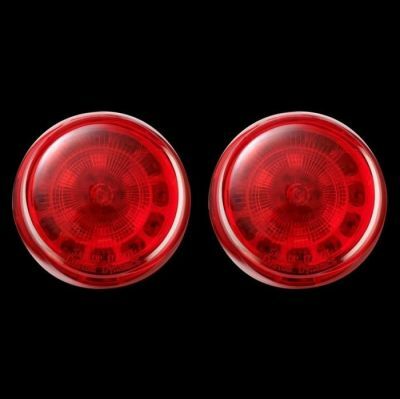 ProBEAM® Red Rear Turn Signals are DOT and SAE compliant when used with ProBEAM® Smoke or Red Lenses. 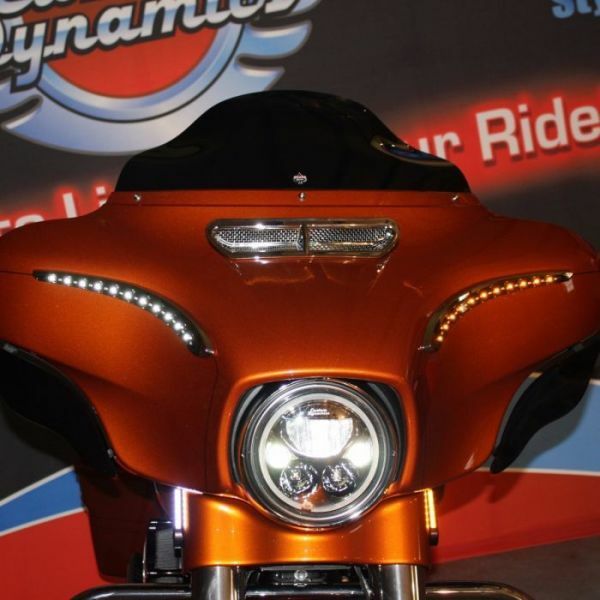 Turn Signals are NOT compatible with Custom Dynamics® LED LED TriBAR for 2010 - 2013 Street Glide®/Road Glide® Custom Models. 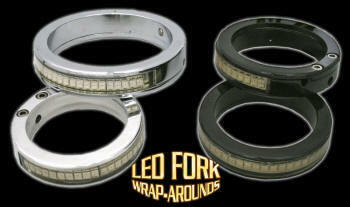 grade LEDs available. 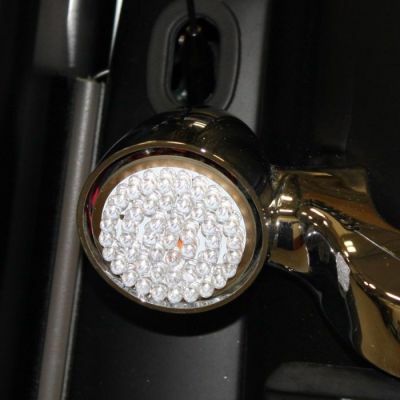 ProBEAM® turn signals use automotive grade LEDs to produce an even brighter light output with a wider viewing angle. The 24 red ProBEAM® LEDs showcase a smooth red light that functions as a full-contrast turn signal for maximum visibility. 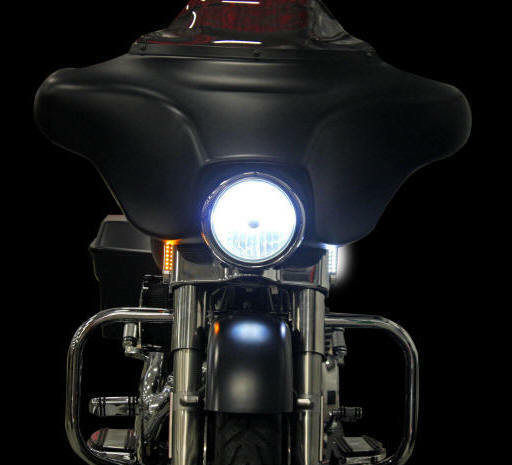 Plug & Play for rear turn signals on Harley-Davidson® models with 1156 single contact bulb bases and Bullet Style (pop-off) lens. Models with center taillight. 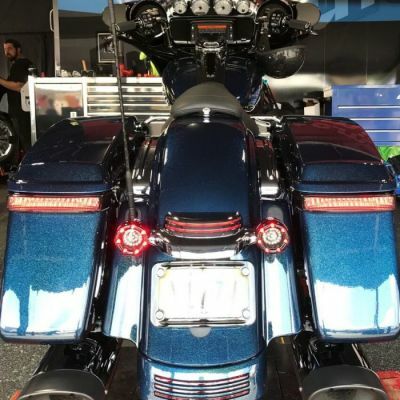 2011-Earlier Dyna®, 2010-Earlier Softail®, 2013-Earlier Touring and Trikes and all V-Rod® models to ensure proper turn signal function and flash speed. 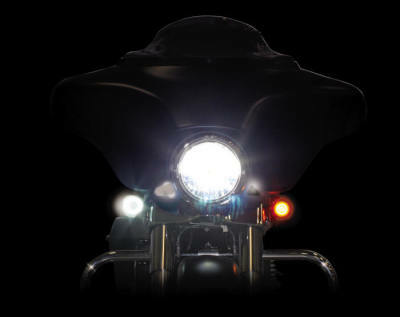 ProBEAM® Turn Signals include red lenses, are DOT and SAE Compliant and backed by a Lifetime LED Warranty. Sold as a Pair. light that functions as a full-contrast turn signal for maximum visibility. 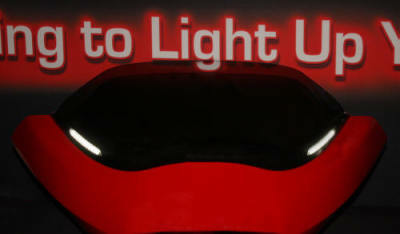 and backed by a fetime LED Warranty. 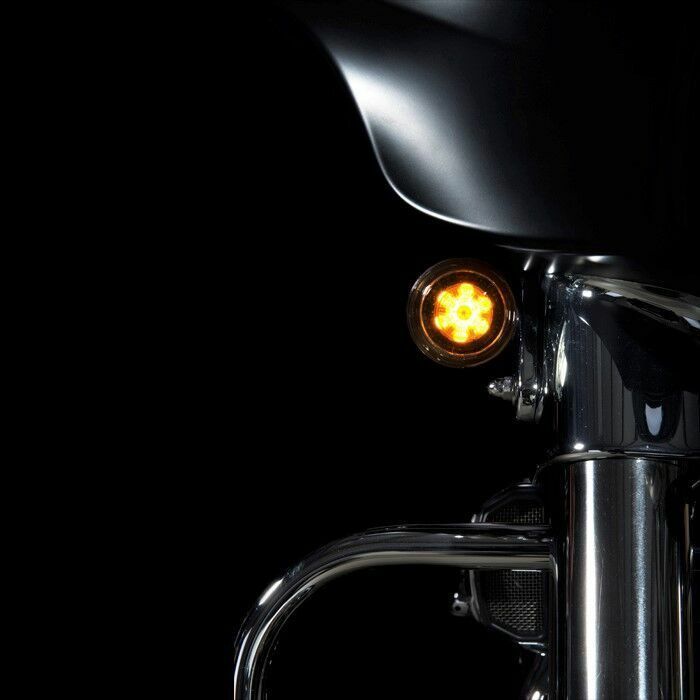 V-Rod® models to ensure proper turn signal function and flash speed. 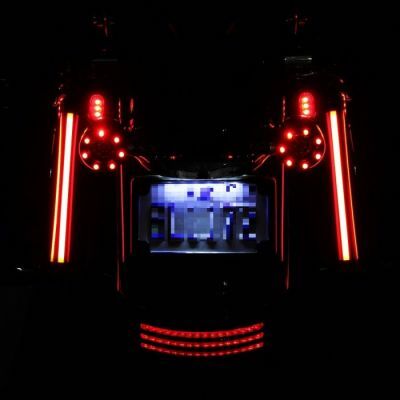 Bullet Ringz™ are an OEM LED Turn Signal replacement with 7 LEDs embedded into an outer aluminum bezel and a cluster of 24 inner LEDs. Available with 1157 bases for simple plug and play installation on Harley-Davidson® models with 1157 dual contact bases (stock turn signals function as run/turn) and Bullet Style (pop-off) lens. Bezel is available in a chrome or gloss black finish with your choice of LED and lens color. BCM Compliant. Lifetime Warranty against LED failure. Sold as a Pair. The solid Amber LED cluster the outer ring will stay on while the center 24 Amber LEDs flash for turn signal. 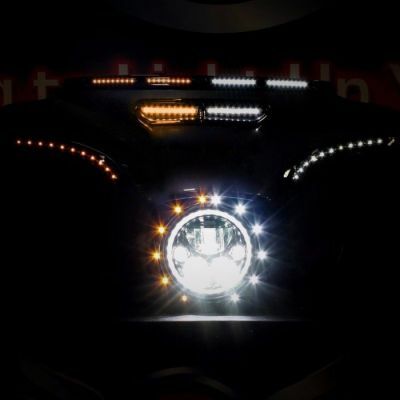 The Amber/White LED cluster has an outer ring of 7 Whilte LEDs which illuminate as a running light. 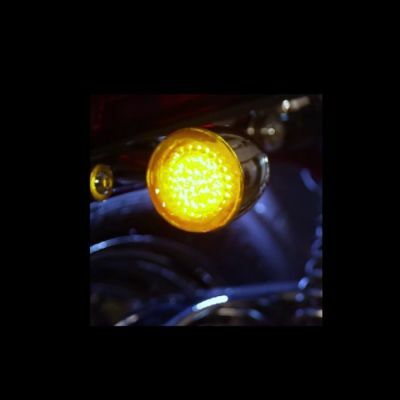 When the turn signal is activated the outer ring turns completely off for the entire turn signal cycle providing greater visibility to the 24 inner LEDs which provide a full contrast Amber turn signal. Use Custom Dynamics® JAE Bullet Ringz™ on all 2016-2018 CVO™ models. View Additional Fitments. 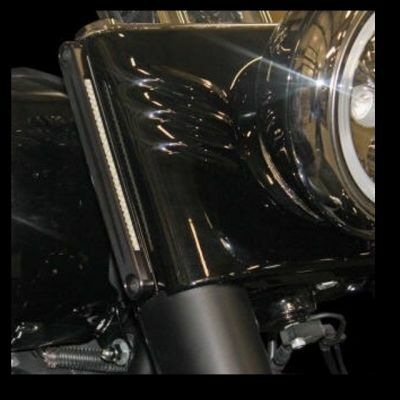 SMART Signal Stabilizer™ is required on 2013 & Earlier Sportsters®, 2011 & Earlier Dynas®, 2010 & Earlier Softails®, 2013 & Earlier H-D™ Touring and H-D™ Trikes and all V-Rod® Models to ensure proper function and flash speed of LED Turn Signals. 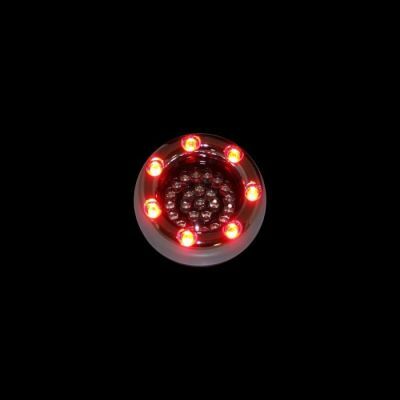 These Rear LED turn signal are a OEM replacement with 7 LEDs embedded into an outer aluminum bezel and a cluster of 24 inner LEDs. 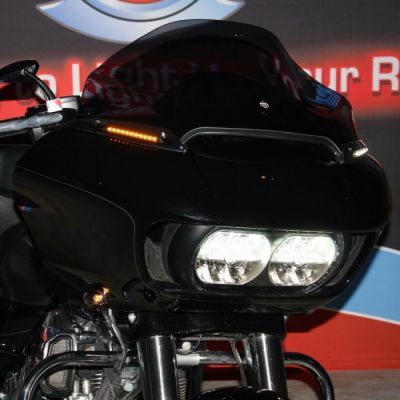 1157 pigtail base allows for the outer ring of Red LEDs to function as a running light while the 24 Red inner LEDs operate as the brake light and turn signal. Choice of Chrome or Black Bezel with option of Smoked or Red lens. BCM Compliant. Lifetime Warranty against LED failure. Sold as a Pair. 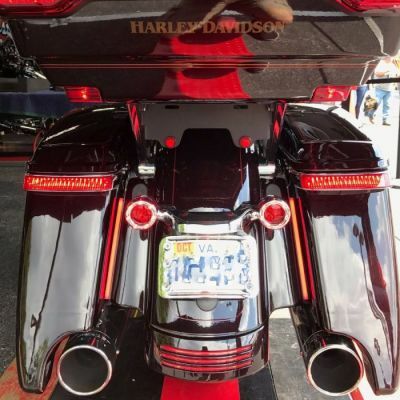 Plug & Play rear turn signals on Harley-Davidson® Models with 1157 dual contact bases (turn signals function as run, brake, and turn) and WITHOUT a center taillight as well as 2009 - 2012 Street Bob. Must have New Bullet Style (pop-off) lenses. Use JAE Bullet Ringz™ on all 2016-2018 CVO™ models. View Additional Fitments. If used in conjunction with the LED Tri-Bar for 2010 - 2013 Street Glide®/Road Glide® Custom Models this unit will act as a solid red cluster. 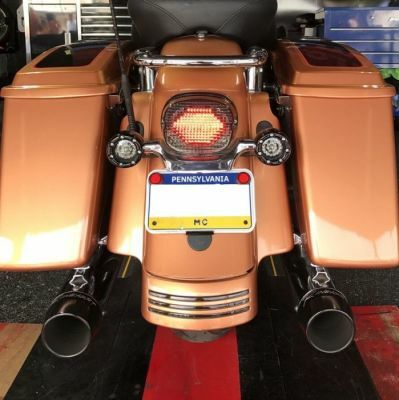 SMART Signal Stabilizer™ or load equalizer is required on 2013 & Earlier Sportsters®, 2011 & Earlier Dynas®, 2010 & Earlier Softails®, 2013 & Earlier H-D™ Touring and H-D™ Trikes and all V-Rod® Models to ensure proper function and flash speed of LED Turn Signals. Use in conjunction with a Magic Strobes™ Brake Light Flasher to add 10 easy to select flash/strobe patterns with the brake is applied. 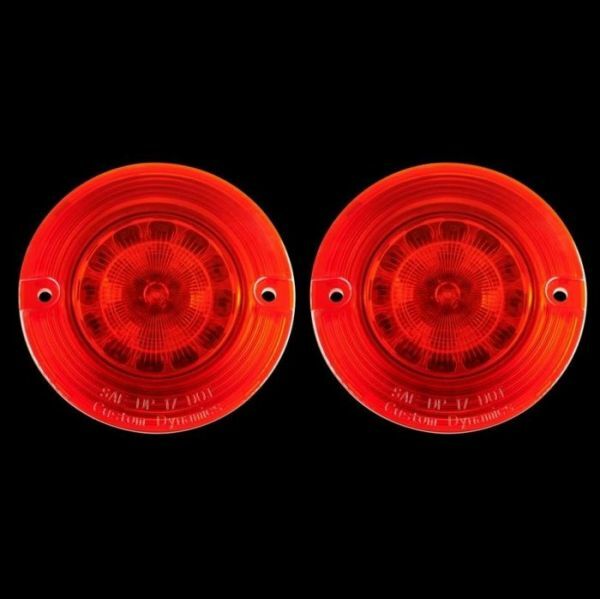 These Rear LED turn signals are OEM replacements with 7 LEDs embedded into an outer aluminum bezel and a cluster of 24 inner LEDs. 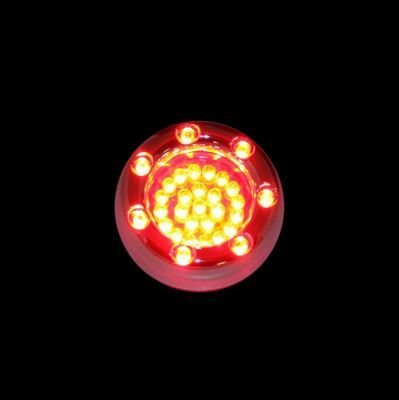 1156 pigtail bulb base available in Red or a Dynamic Clusters2™. BCM Compliant. Lifetime Warranty against LED failure. Sold as a Pair. Red option is plug and play and operates as Turn Signal Only unless a SMART Triple Play® Unit or any r/b/t module is installed. The Smart Triple Play Unit will convert the turn signal to function as run/brake/turn with your choice of 10 easy to select flash/strobe patterns. 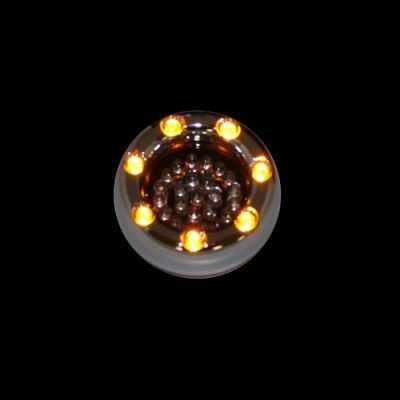 Dynamic Clusters2™ are multi-color (Amber/Red) LED Clusters used for rear turn signal applications. 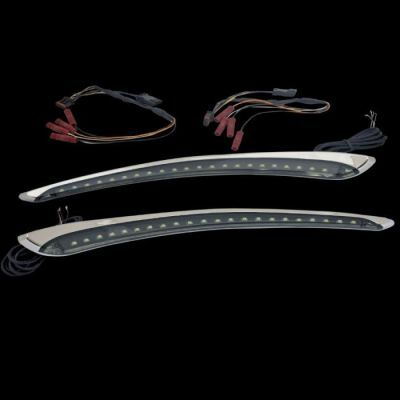 1156 pigtail base allows 24 center amber LEDs to function as the turn signal, two additional wires are tapped into a running and brake light power to allow the outer ring of 7 red LEDs to function as a running light & brake light. 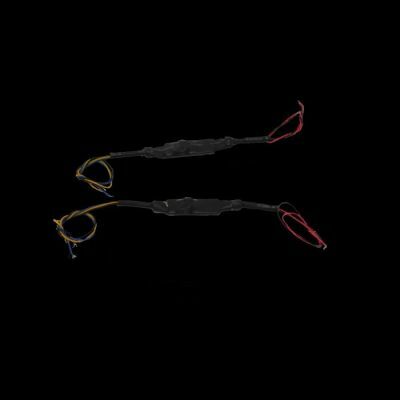 The Dynamic Clusters2™ (Amber/Red) are NOT compatible with a SMART Triple Play® or any Run/Brake/Turn module. This unit is, however, compatible with our Magic Strobes™ Brake Light Flasher. Fits Harley-Davidson® models with 1156 single contact bases (models WITH a center taillight) and 1156 single contact bases (turn only). Fits bikes with Bullet style pop-off lens. Uses existing housing base. View Additional Fitments. or smoked New Bullet style lens that fits the stock housing (sold separately). BCM Compliant. Lifetime Warranty against LED failure. Sold as a Pair. View Additional Dynamic Ringz™ Fitments. 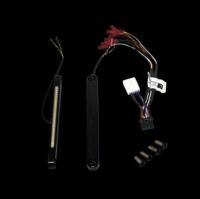 Complete your LED turn signal conversion with Rear LED Turn Signal Inserts. Front LED turn signal OEM replacement made with 48 5mm Amber LEDs per unit. 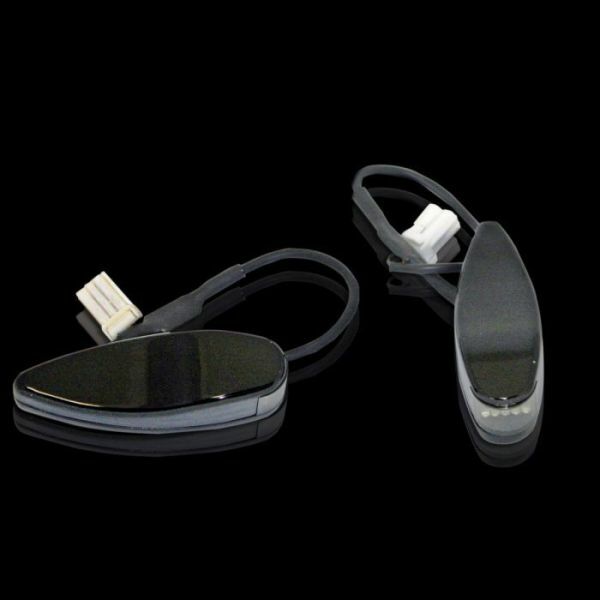 1157 pigtail bulb base allows for plug and play installation with run and turn signal function! 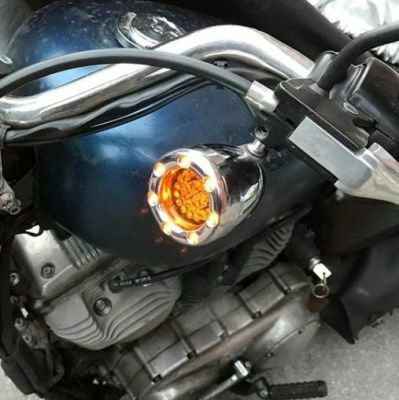 All 48 Amber LEDs to illuminate for Running along with a full contrast (on/off) turn signal! BCM Compliant. Lifetime Warranty against LED failure. Sold as a Pair. 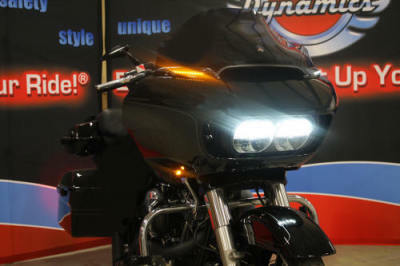 Plug & Play on Harley-Davidson® US Models with front 1157 dual contact bases and Bullet Style lens. View Additional Fitments. 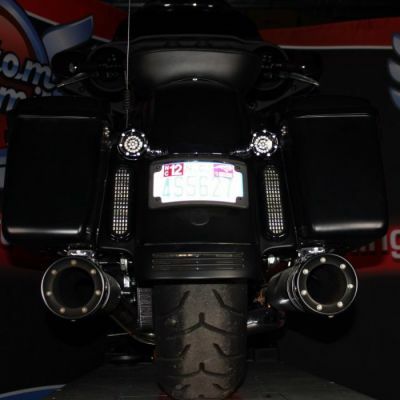 2013 & Earlier H-D™ Touring and H-D™ Trikes and all V-Rod® Models to ensure proper function and flash speed of LED Turn Signals. 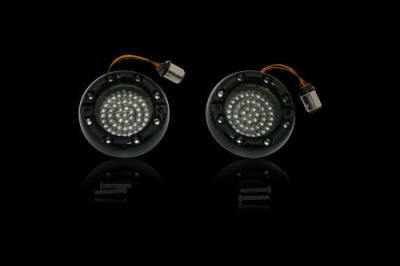 LED Turn Signals also available for International (HDI) Models. 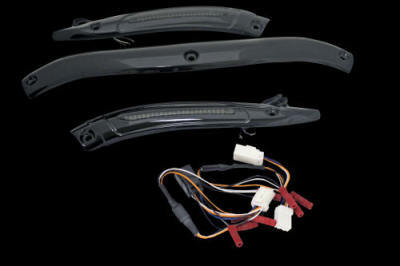 Front LED turn signal OEM replacement made with 48 5mm LEDs per unit. JAE pigtail bulb base allows for plug and play installation with run and turn signal function! BCM Compliant. Available in solid Amber or our popular Amber/White Dynamic Ringz™. Lifetime Warranty against LED failure. Sold as Pair. 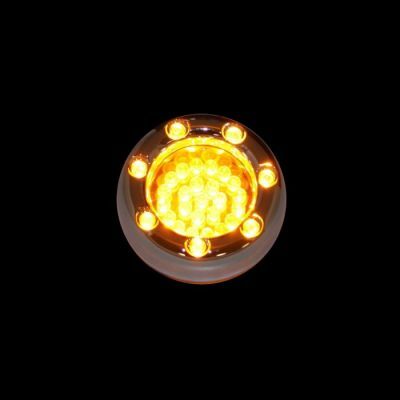 Solid Amber option provides all 48 Amber LEDs to illuminate for Running/DRL along with a full contrast (on/off) turn signal. 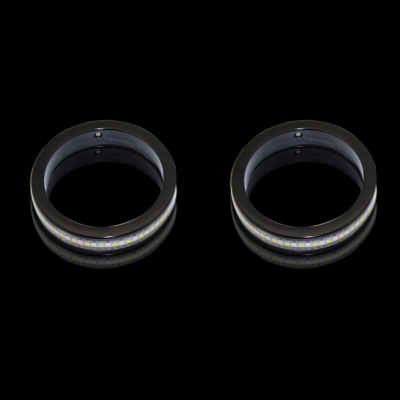 Dynamic Ringz™ consist of 24 center Amber LEDs that function as the turn signal and 24 outer White LEDs that function as a running light. When a turn signal is activated the White LEDs turn completely off for the entire turn signal cycle providing greater visibility to the amber turn signal. Must be used with a clear or smoked New Bullet style lens that fits the stock housing (sold separately). Plug & Play 2016-2018 Harley-Davidson® Street Glide CVO™, Limited CVO™, 2016 Road Glide Ultra CVO™, 2018 Road Glide CVO™ & 2016-2017 Pro Street Breakout CVO™. View Additional Fitments. 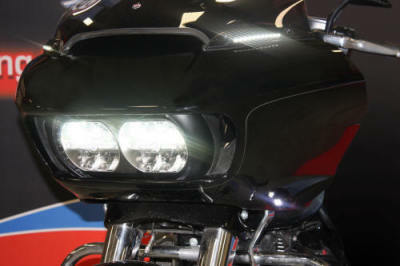 Check out the TruBEAM® LED Headlamps with built in Halo. 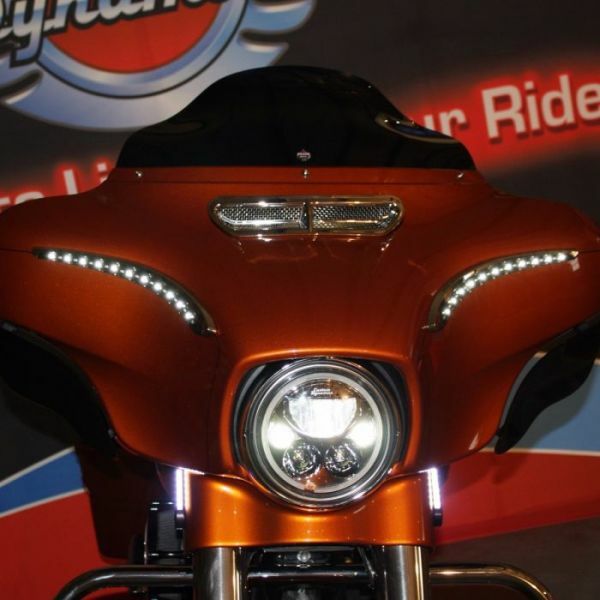 Streamline the look of your Road Glide® with LED Turn Signals. 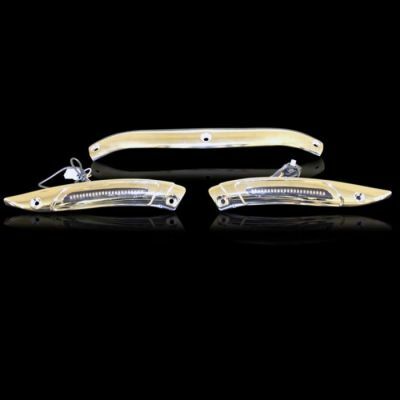 The sleek, aluminum housings are direct replacements for your stock front bullet turn signals, providing both White DRL Running Light and full-contrast Amber LED Turn Signals, with a plug and play installation. This simple modification completely changes the look of the Shark Nose fairing, offering a sleeker more custom look. Available with a Chrome or Gloss Black Finish or as a Raw unit ready for paint. Lifetime LED Warranty. No additional modules required. Sold pair. 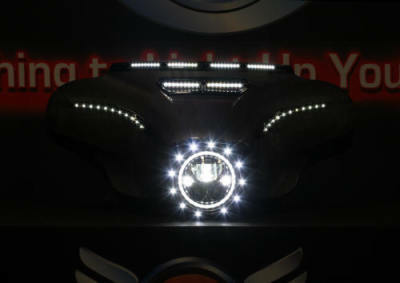 White DRL Running Light and full-contrast Amber LED Turn Signals behind a smoked lens. 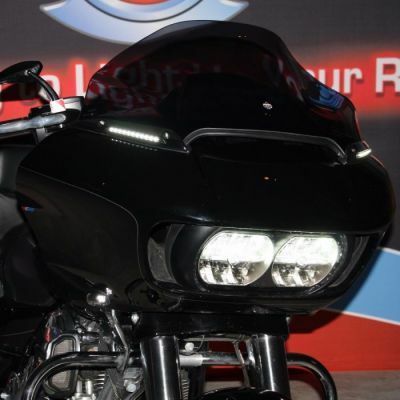 Nose fairing, offering a sleeker more custom look. Available with a Chrome or Gloss Black Finish. Lifetime LED Warranty. Sold pair. Plug and play SMART Signal Stabililzer™ or load equalizer required to prevent rapid turn signal flash. 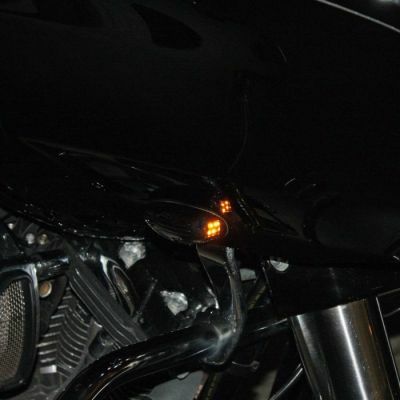 - White DRL Running Lights, Amber LED Turn Signals in a Billet Housing. 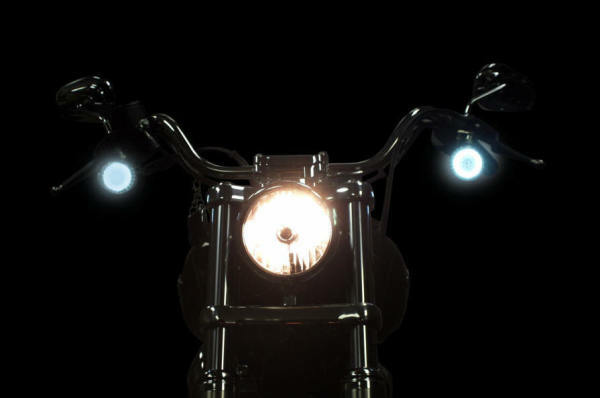 - LEDs function with 4 way hazards and alarms when bike is on or off. 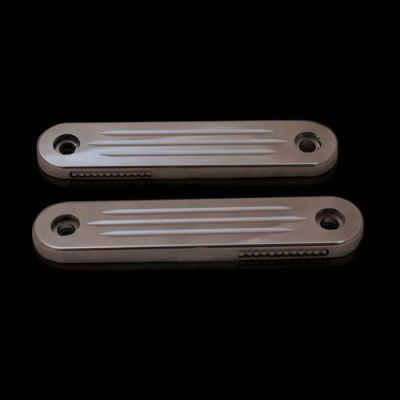 - T6061 Billet Aluminum with choice of Chrome, Black, or Contrast Finish. when bike is on or off. 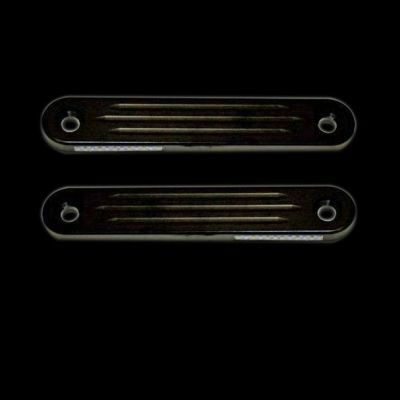 T6061 Billet Aluminum with choice of Chrome, Black, or Contrast Finish. Black, or Contrast Finish. Lifetime Warranty Against LED Failure. Sold as a Pair. SMART Signal Stabilizer™/ Load Equalizer required on all 2010 and earlier models. 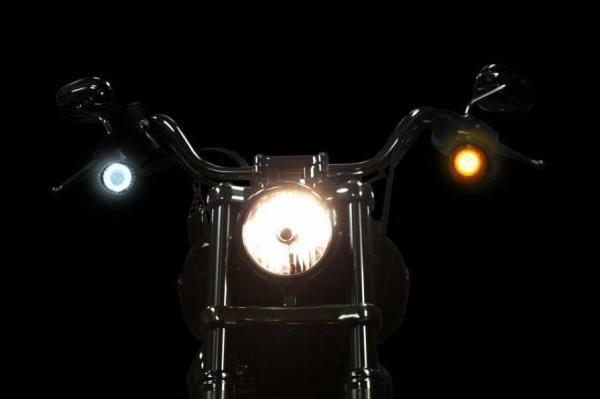 Billet Fork Wrap-Arounds™ Turn Signals with 30 Amber LEDs per unit. Made from T06061 Billet Aluminum. Available in Black Annodized or Chrome Finish with choice of Clear or Smoke Lens. SMART Signal Stabilizer™ may be required. Lifetime Warranty Against LED Failure. Sold Pair. *Please confirm size on motorcycle before ordering. mm options listed here to ensure proper fitment. 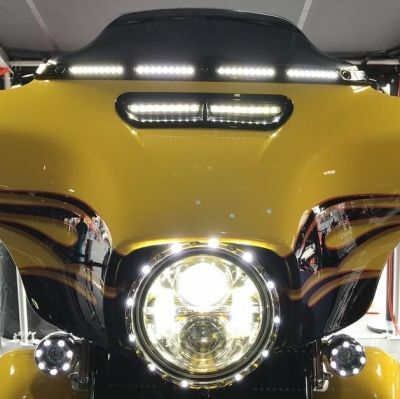 A great way to convert your single intensity Custom Dynamics® Amber Wrap Arounds to Dual Intensity with the advantage of 70% Intensity Running Lights and a Full Contrast Turn Signal Flash. 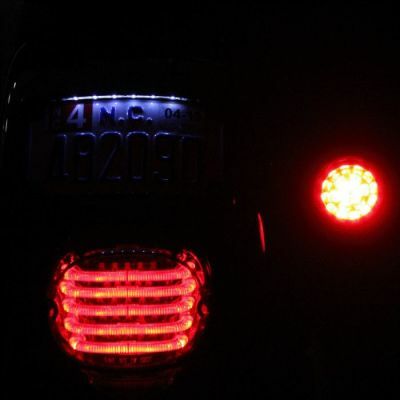 For Front Turn Signal Amber LED Fork Wrap-Around applications ONLY. Amber turn signal. Available in Chrome or Gloss Black finish. Direct bolt on installation. Mounting hardware included. Lifetime Warranty against LED failure. Sold Each. confirmation fitment on any other brand of fairing. lamp is deactivated. Comes in choice of Chrome or Gloss Black Finish with a Smoked lens. Plug and Play. 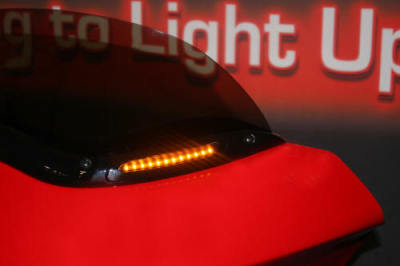 Works with both incandescent & LED turn signals. 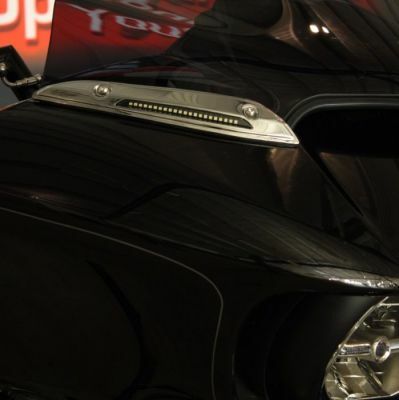 Increase your side visibility while customizing the look of your Shark Nose fairing! 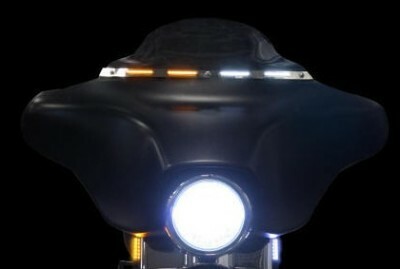 This Dynamic Amber/White LED Windshield Trim directly bolts on to the stock fairing. Plug and Play. 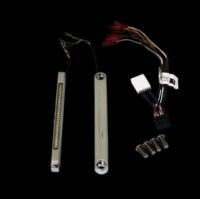 Works with both incandescent & LED turn signals. Lifetime warranty against LED failure. Custom Dynamics® recommends upgrading the stock windshield well nuts to the Klock Werks Flare™ Nuts (sold separately) to ease the installation process and ensure lasting durability. Chrome or Gloss Black Finish. Lifetime Warranty Against LED Failure. Sold as a pair. the fairing behind the batwing fairing trim to route wires. 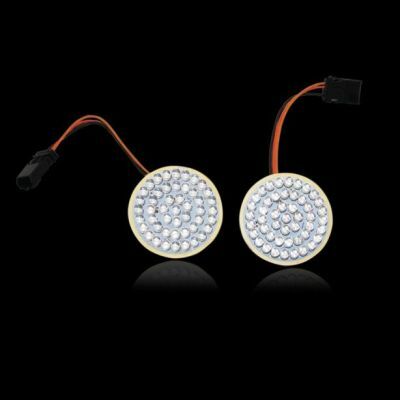 Warranty Against LED Failure. Sold as a pair. behind the batwing fairing trim to route wires. 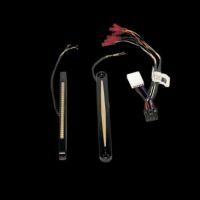 a Plug and Play LED Light Kit for use with the Decorative Vent Trim Insert (sold separately). LEDs as DRL and 30 amber LEDs for turn signal. Want a Batwing Vent Insert? 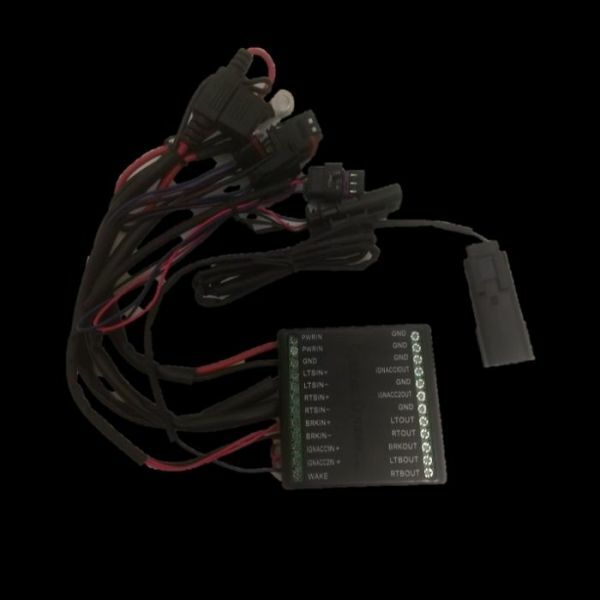 can be wired to the DLI output providing completely isolated plug and play trailer lighting hook up. adjustable brake flash/strobe patterns to the brake, right turn/brake, and left turn/brake power outlets. 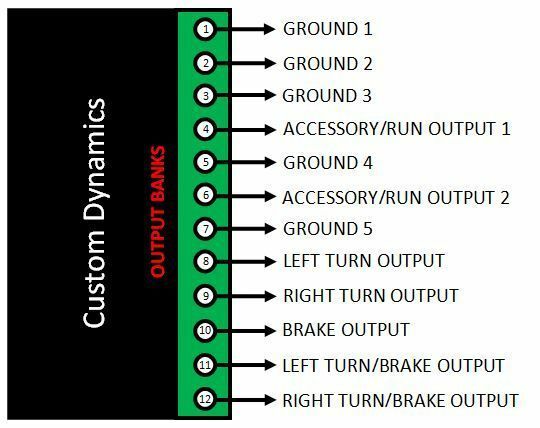 Note: Additional CanBus Adapter (1 per turn signal) is required when stock rear turn signals are removed for custom applications. Sold Separately.